When Engaging Affairs approached Marigold & Grey about working together on the custom wedding welcome gift design for Abha and Hunter’s modern Indian wedding at the Clifton Inn, we were thrilled! Traditional Indian weddings are steeped in tradition and are always complete with vibrant colors and an electric energy and love shared between the couple and their family and friends. 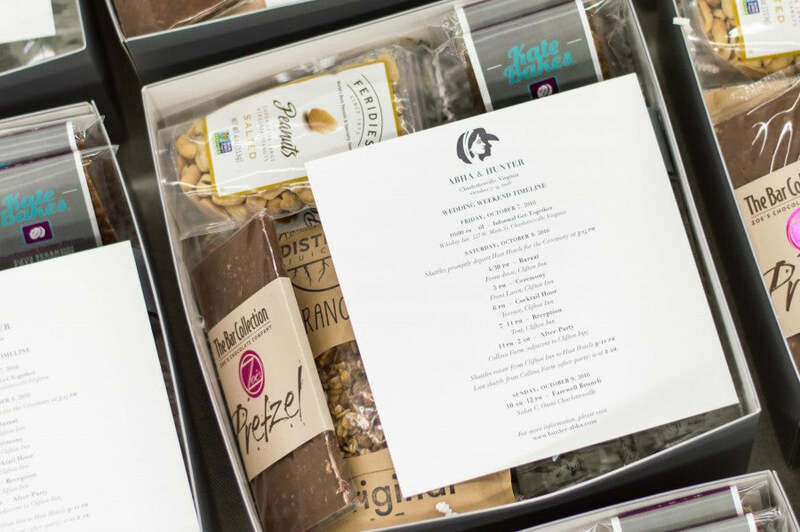 They are an experience, and we set out to design gifts that uniquely welcomed guests while making each person feel excited for the weekend of events! When designing custom gifts, packaging is always top of mind. To keep the modern aesthetic at heart, we carefully chose grey boxes as the base for the design. As a special request from the bride, we accented this piece with ribbon reminiscent in color of a brand new penny (so fun!). 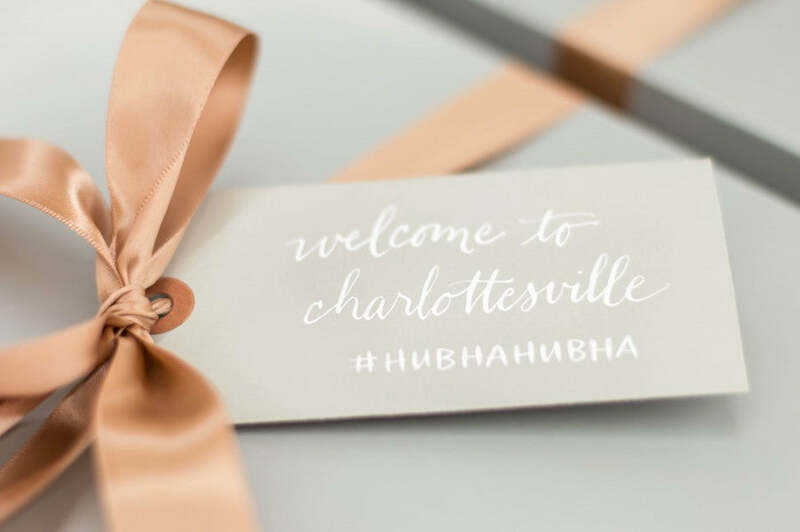 A gift is never complete without a gift tag, and Just Write Studios carefully wrote “welcome to Charlottesville” and the couple’s unique hashtag in white calligraphy. Inside, guests were first met with a wedding timeline again designed by Just Write Studios. 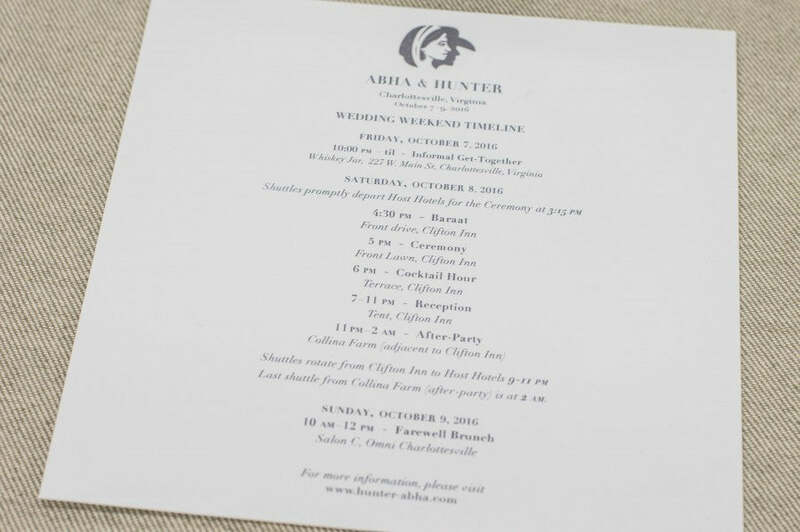 The custom wedding logo of Abha and Hunter is my favorite detail of this piece! I also love the information the couple and Engaging Events opted to include. Always note the locations of each wedding event and the time transportation departs when thinking about wedding timelines. However, I also love the suggested attire for Friday’s welcome dinner was mentioned – what to wear is always a question guests ask! For the rest of the contents, we opted for a fun take on sweet and salty treats. A+H adore D.C., but their wedding was held in Virginia. We introduced guests to their favorite delectable foods from both places. 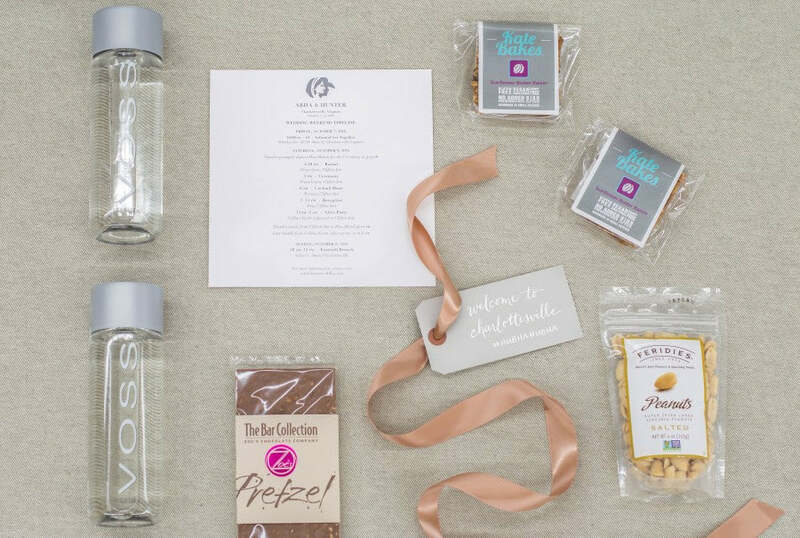 Both the bride and the groom shared D.C’s Zoe’s Pretzel Bars rank among their top favorite things. Kate Bakes Bars also represented D.C., while Feridie's peanuts represented their wedding’s Virginia ties. Voss water was also a clear necessity! Between the custom welcome gifts, welcome party, Clifton Inn’s beautiful venue spaces, and a farewell brunch, it’s safe to say Abha, Hunter, and their guests had an unforgettable wedding weekend! We’re always so grateful to work with Engaging Affairs, and we’re already looking forward to our next wedding together.